Congratulations to the newest facilitators for the Reality Enrichment And Life Lessons (REALL) project! They completed a two-day training on 5/3/18, preparing them to bring REALL to their communities. Did you know? A high school dropout will earn $1 million less than a college graduate over his or her lifetime, and $200,000 less than a high school graduate, according to the U.S. Census. OACAC serves people from all walks of life, and we wanted to help our teenage community avoid the need for our assistance in the future, which is why the REALL project was developed. REALL is for grades 7th through 12th. It’s an active, hands-on experience that challenges teens to think critically about their lives through simulation of a reactive life and a proactive life. 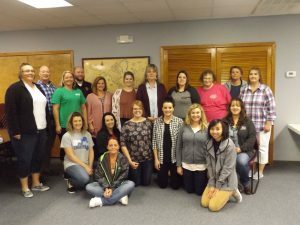 Pictured below: REALL Facilitators with Missouri Valley Community Action Agency, Central Missouri Community Action, New Bloomfield R-III School District, Northeast Kansas Community Action Program, and OACAC.